City of Lake Elsinore's walking and biking to school survey! The City of Lake Elsinore is developing an Active Transportation Plan and launching its #ActiveLE effort to solicit your ideas on how to make it easier and safer for you and your children to get to and from Lake Elsinore schools on foot and bike. 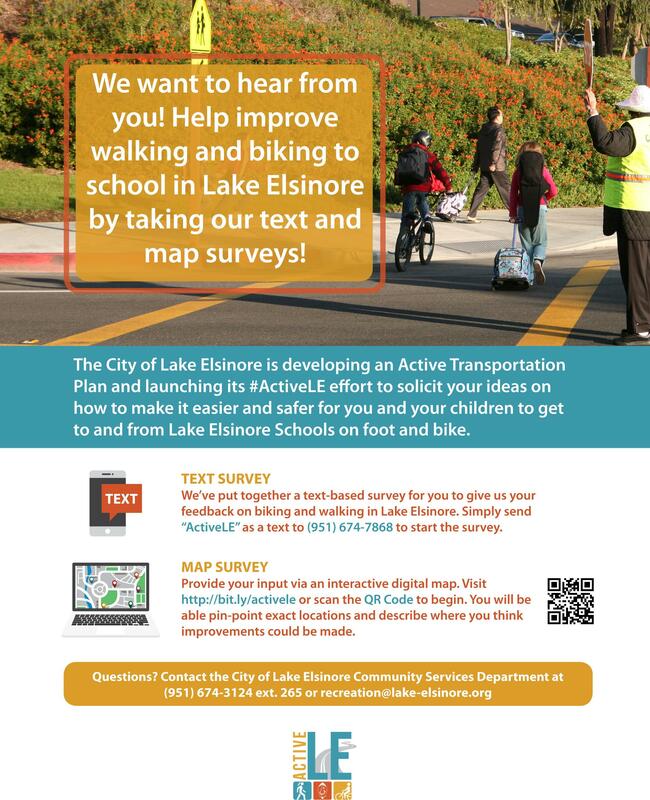 We've put together a text-based survey for you to give us your feedback on biking and walking to school in Lake Elsinore. Simply send "ActiveLE" as a text to (951) 674-7868 to start the survey. Provide your input via an interactive digital map. Visit http://bit.ly/activele or scan the QR Code below to begin. You will be able to pin-point exact locations and describe where you think improvements could be made.